The New Jersey Division of Gaming Enforcement (DGE) has banned OddsShark.com from working with any regulated online sportsbooks in the state. 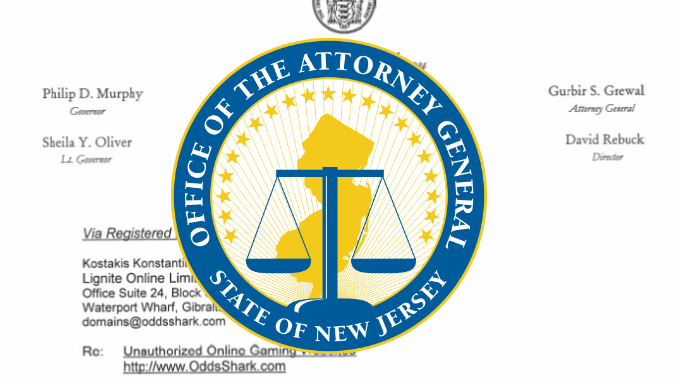 New Jersey's Office of Attorney General sent OddsShark a now public notice explaining the DGE reviewed their site and accessed they promote unauthorized internet gaming and sports betting to New Jersey residents alongside regulated and legal betting. The DGE has also informed all regulated online sportsbooks in New Jersey they must cease doing business with any site that promotes illegal gaming sites so OddsShark won't be the last banned from the budding sports betting market in New Jersey. What did OddsShark do to get banned? Prior to the repeal of PASPA, OddsShark.com and other gambling-centered sites in the US offered American bettors access to illegal offshore betting. We would list out some of the most egregious offshore betting sites that were promoted on these illicit sites but have decided to never mention illegal bookmakers by name. Once the legal online betting market opened in New Jersey, these same affiliate sites tried to jump into the regulated and legal market by promoting licensed US bookmakers but didn't stop promoting the illegal offshore ones. If a New Jersey resident went to OddsShark.com they would see both legal and illegal betting sites listed together with no indication which were licensed in New Jersey and which were offshore. Unsurprisingly, this forced the Division of Gaming Enforcement to ban OddsShark.com from working with regulated betting sites to avoid confusing New Jersey bettors into signing up with illegal betting sites. Who can you trust to recommend legal betting sites in NJ? Gambling.com has only ever reviewed and recommended fully legal, regulated and licensed online betting sites. This means Gambling.com has not and will never recommend or review offshore sites. Until the repeal of PASPA opened the door to a legal online betting market in the US, Gambling.com did not serve US players. Every New Jersey betting site recommended on the site is licensed to operate legally within the state. Fortunately, we are not alone as other sites covering New Jersey sportsbooks hold these same high standards including Bookies.com, TopNJSportsbooks.com and TopUSBets.com. Illicit gambling-related sites aren't the only ones promoting offshore bookmakers to Americans unable to legally bet yet. Major US media companies have consistently promoted odds from illegal sites in their content across all mediums. Bleacher Report, Sports Illustrated and a number of other major sports media companies have tried to capitalize on the thirst for gambling content since the spread of US sports betting but did so by promoting illegal and non-US betting sites. In the article referenced in this Sports Illustrated tweet, they promote multiple illegal bookmakers. It should also be noted Sports Illustrated partners with the illicit OddsShark.com and consistently promote the site within their content. All over twitter and throughout their articles, videos and podcasts US media companies discuss, promote and highlight odds from the same sites OddsShark.com and the like would. To avoid all this confusion yourself, stick with sites like Gambling.com for your online sports betting needs. You can trust all the information provided is accurate and up to date, and all the sites reviewed are licensed and trusted.